CoNexus is honored to be recognized among the best places to work in the state of Georgia. Atlanta, GA (PRWEB) — July 19, 2017 — CoNexus CPA Group, an award-winning, Atlanta-based Certified Public Accounting (CPA) firm, was recently named as one of the 2017 Best Places to Work in Georgia by Georgia Trend magazine. The list of the Best Places to Work in Georgia was created by Georgia Trend, the Society for Human Resource Management (SHRM) – Georgia State Council and Best Companies Group. The statewide survey and awards program is designed to identify, recognize and honor the best places of employment in Georgia. 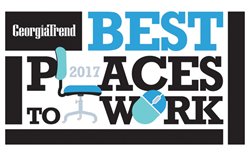 The 2017 Best Places to Work in Georgia list is made up of 20 companies, in which CoNexus ranked n the top ten for small-to-medium employers. To be selected, companies from across the state had to successfully complete a two-part survey process. The first part consisted of evaluating each nominated company's workplace policies, practices, philosophy, systems and demographics. This part of the process was worth approximately 25 percent of the total evaluation. The second part consisted of an employee survey to measure the employee experience. This part of the process was worth approximately 75 percent of the total evaluation. The combined scores determined the top companies and the final rankings. Since 1985, Georgia Trend has been the magazine of Georgia business, politics and economic development. The award-winning monthly magazine offers its more than 50,000 subscribers a balanced analysis of business and political trends around the state, showcases economic development at both state and local levels, creates a forum for state and local leaders to voice their opinions on critical issues, and spotlights individuals making a positive impact on the state of Georgia. Through the magazine, website, its Georgia Trend Daily business news service and the Latest Trends blog, Georgia Trend has become indispensable for the leaders who shape our state. Learn more about Georgia Trend at http://www.georgiatrend.com/.